The incredible egg is a nutritional powersource for protein and other important minerals tha tfuel your child's brain and overall health. Here are some ideas, outside of the same ol' fried and scrambled to get your kids eating eggs! Make an egg pizza! 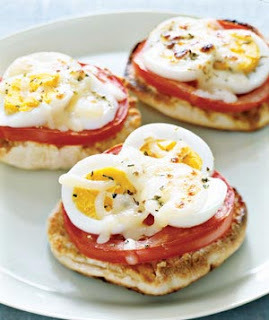 Toast an English muffin, add a slice of tomato with slices of hard boiled egg on top and drizzle with your favorite cheese for a nutritious start to the day for breakfast! Combine yolks with sauteed spinach and pieces of ham or turkey to make your own version of "green eggs and ham (or turkey) deviled eggs"
Add slices of eggs or just egg whites to sandwiches. They're an egg-cellent addition to BLTs. Mash yolks with pico de gallo for deviled eggs with some kick! Make egg-salad wraps for a snack or lunch staple. Sandwich a fried egg between a waffle split in half. Finely chop eggs and toss into macaroni or potato salad. Wrap scrambled eggs in a high fiber tortilla and top salsa and avocado. Mix chopped egg into tuna salad. Family Chores: Creative Ways to Get Them Done! Healthy Tips for Formula Feeders! Martial Arts for You & Your Kids!